Support hardware for the Neo polyphonic pickups requires a suitable cabling system for connecting the multi-channel outputs to an audio interface. In addition to carrying audio signals, it will also have to carry supply voltage and MIDI data. MIDI control is the only reasonable way to control parameters for all channels. I’ve tried using snake cables. For the prototype, they work fine. But they are heavy, bulky and cumbersome to use (I find it awkward to have to tighten the jackscrews every time I plug and unplug). Moreover, I need at least 14 pins for 8 audio channels plus 1 mono, V+ power supply and MIDI. 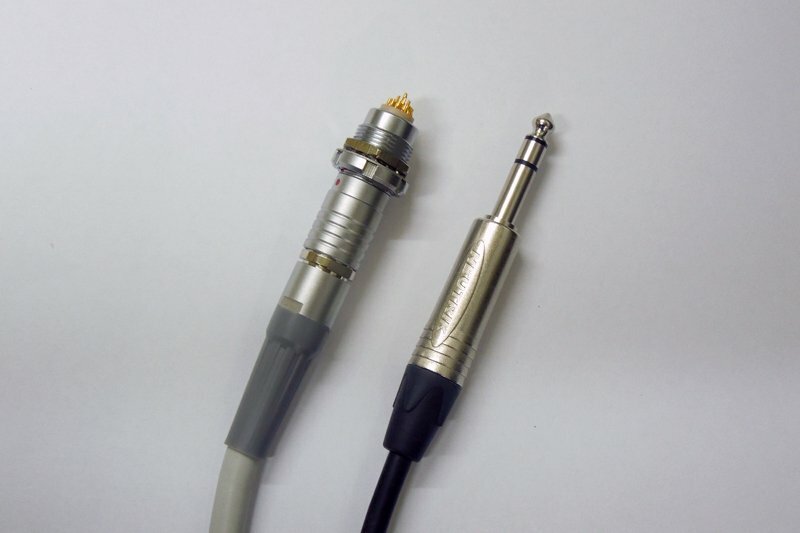 Unfortunately, the DB25 connector, commonly used for snake cabling, is designed to carry only 8 balanced audio signals (hot, cold and ground per channel). 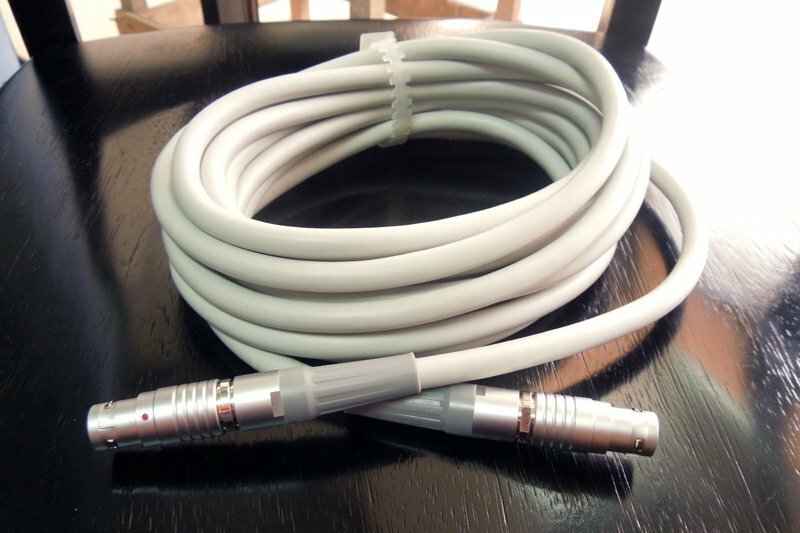 For the prototype, I ended up using a 12 channel snake cable which is even bulkier. Such monstrosity! Yes, I also considered using 13-pin connectors. It’s the same connector used by the Roland GK pickups. I decided not to use it primarily because I find it not sturdy enough to withstand the rigours of stage and studio use. The cables and plastic plugs and connectors Roland uses are flimsy! Why would Roland use such a flimsy connector design? Obviously, they simply want to cut cost. 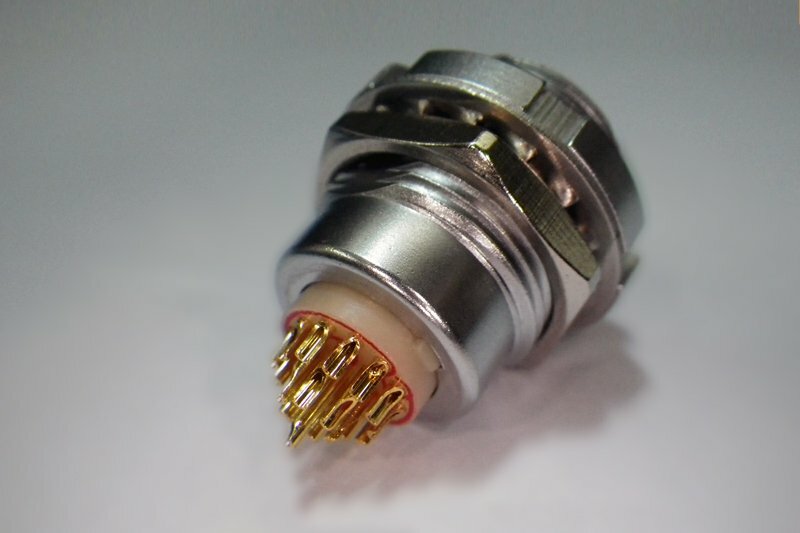 These are metal, self-latching multipole connectors with alignment key and gold plated contacts. These connectors are the best I can find. They are robust yet easy to use with its circular profile and push-pull self-latching technology. Well made, robust connecters should not be bulky! 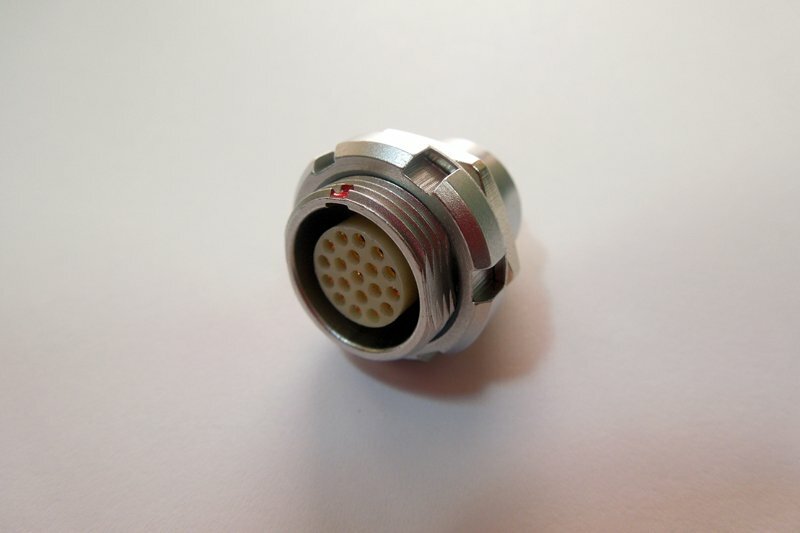 The connector itself is a mere 15 mm (0.6 inch) in diameter. The 19 pin connector (see below) is more than adequate to carry all the signals that I need plus ample room for future expansion. The other end-point will be a breakout box that will provide clean supply voltage, a standard DB25 snake connector for the 8 individual channels, a Roland 13-pin connector for the first 6 audio channels (alas, 6 is Roland’s limitation) and a mono output. The last bit (the mono out) is not as you expect; it’s not a mono mix of the polyphonic pickup, but rather, it’s for additional mono pickups you might want to install in the guitar alongside the polyphonic pickup. We’ll have more on that mono signal later. Next post Here come the Neos!